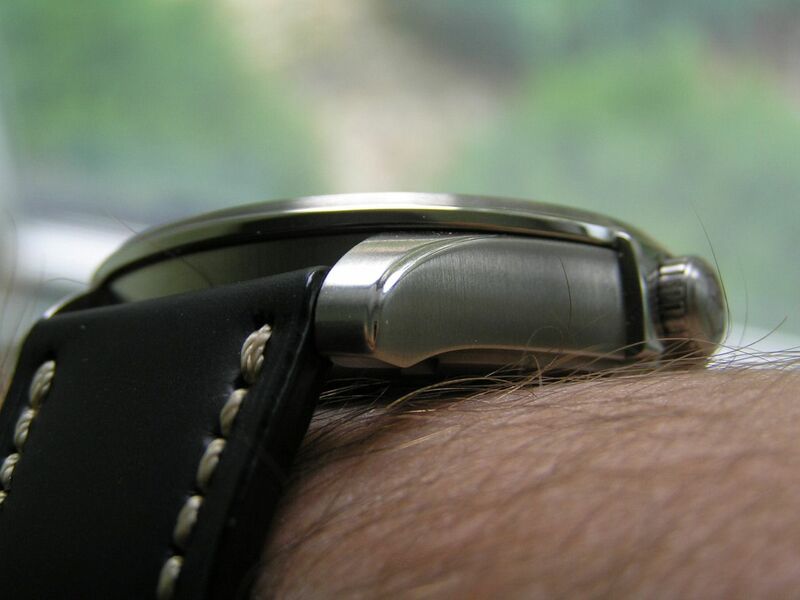 It’s always a pleasure to review a watch that is simple and functional in its design, good looking and rugged. 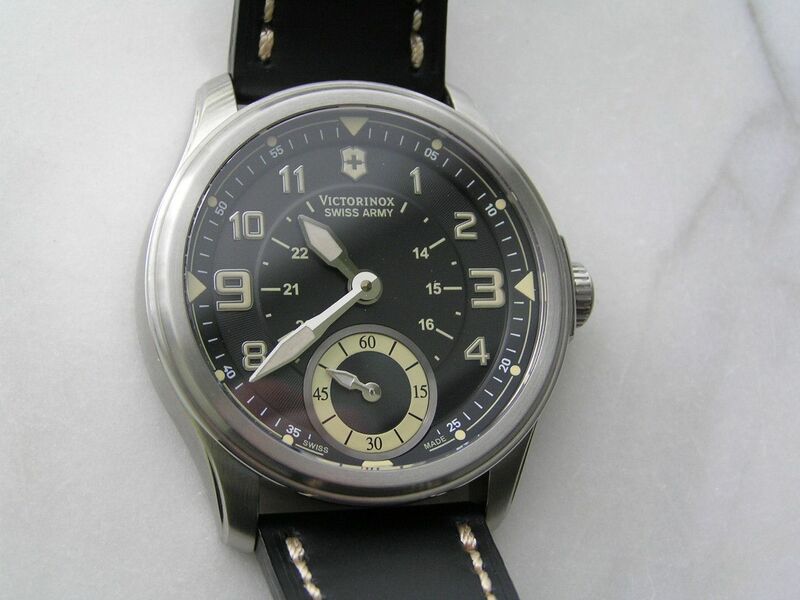 The Victorinox Swiss Army (‘VSA’ for short) Infantry Vintage Mechanical certainly fits the bill. Although this particular model is now discontinued, they can still be found new on the ‘net and at pretty good prices, too. 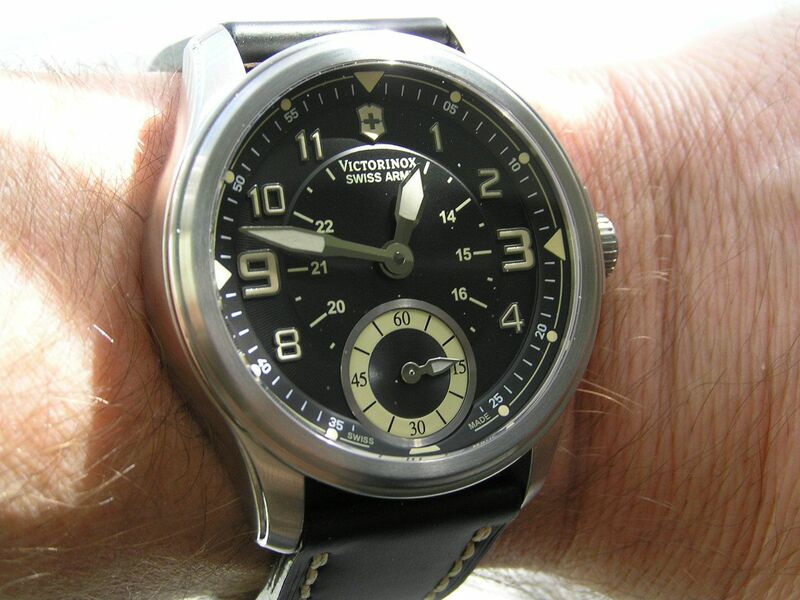 I have already reviewed the big brother to this watch, the VSA Infantry Vintage Mechanical Chronograph and gave that watch high marks. The manual wind, non-complicated version is equally enjoyable. 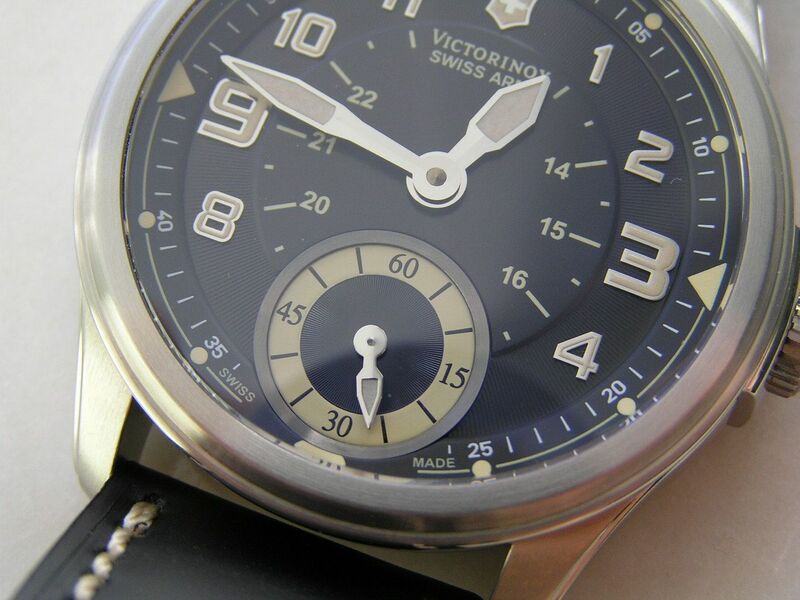 The VSA Infantry Vintage Mechanical starts with a 44mm stainless steel case that sports a brushed and polished finish. It’s nice that even though this watch sports a large-sized movement, VSA managed to keep the case diameter as small as they can. Many watches that have the Unitas manual wind movement clock in at 45 or 46mm in size. The shortness of the lugs on the watch also make it much more manageable on the wrist (lug-tip to lug-tip measures 50mm), so kudos to VSA for designing this piece to a usable size. 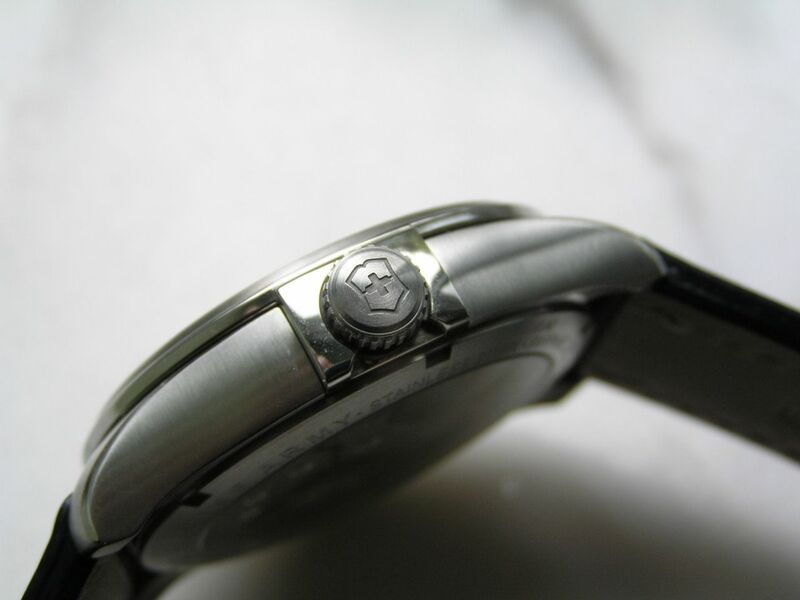 Case diameter with the signed crown is 47.4mm. 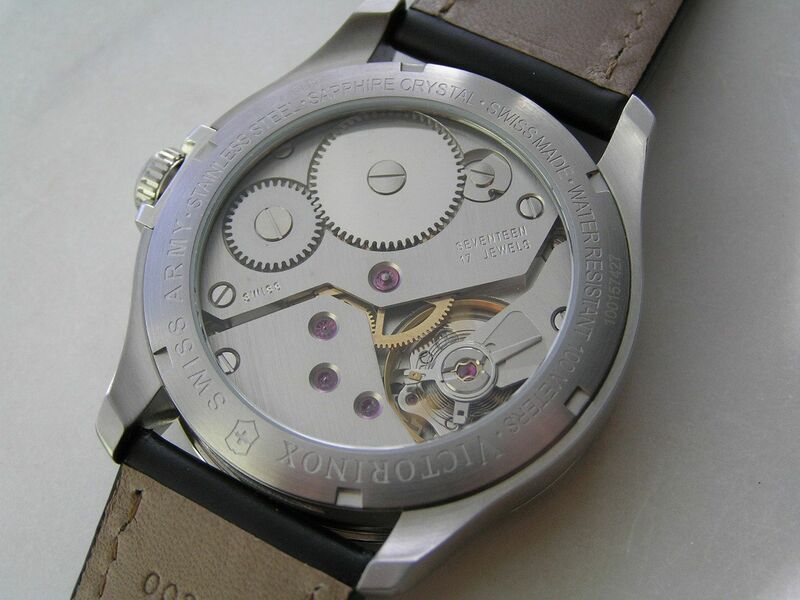 The screwdown caseback is brushed stainless steel and has a mineral crystal display window that shows off the minimally decorated but still attractive workhorse movement. Thickness is 12mm and lugs are an odd 23mm. The fixed bezel is stepped in its design and adds just the right amount of panache to this admittedly simple watch. The VSA Infantry Vintage Mechanical is factory rated for 100 meters of water resistance. Overall quality of the finish work and assembly is first-rate on this VSA. The dial on this VSA is a real beauty. The dial is one of the highlights of the chronograph version and the dial on the manual wind is pretty much the same design. A black center circular section has a 13-24 hour track, which is surrounded by a slightly recessed and textured section that has the raised arabics on it. 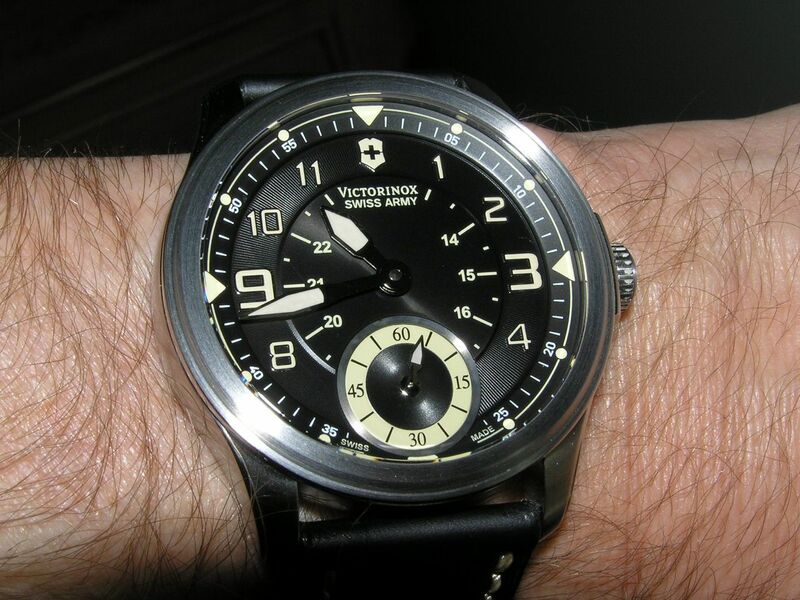 Thankfully, VSA has not ‘hacked off’ any of the numbers on the dial. Instead of putting a half or third of a 5, 6 or 7 on the dial, the designers simply left these numbers off....way to go! It always hacks me off when some dials have arabics that are so cut off that they are barely recognizable as a number...why not just leave it off? That’s what VSA did here and it looks great. 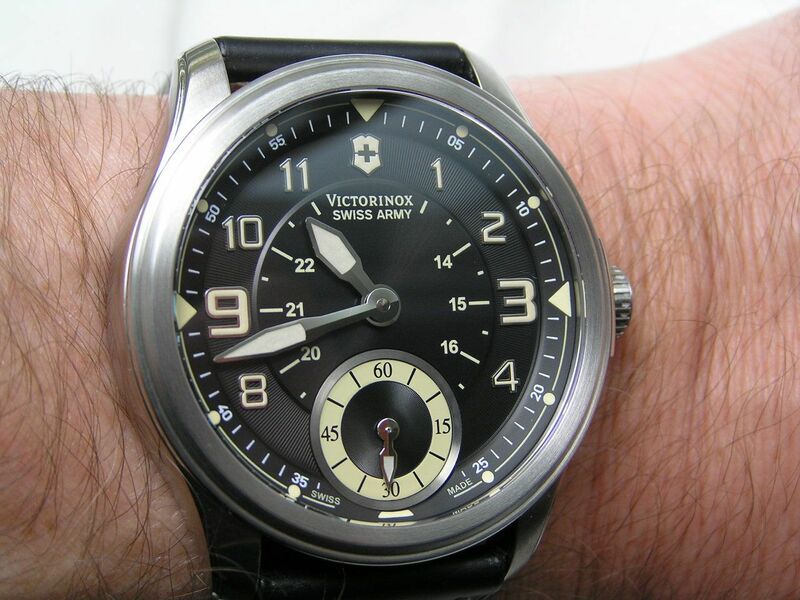 Another design element that works is the restraint VSA had when the decided how large to make the arabics on the dial. Like many watches these days, they have made a couple of the arabics on the dial larger than the rest (the 3 and 9 are about 50-percent larger than the other arabics) but they are not clownishly large, which is good. And given that the dial on this watch is larger to begin with, the slightly oversized arabics don't look out of place. A chapter ring on the outer edge of the dial has lume dots at each five minute mark (pointer style marks at 12, 3 and 9) along with hash marks for minute markers and small arabics every five minutes. 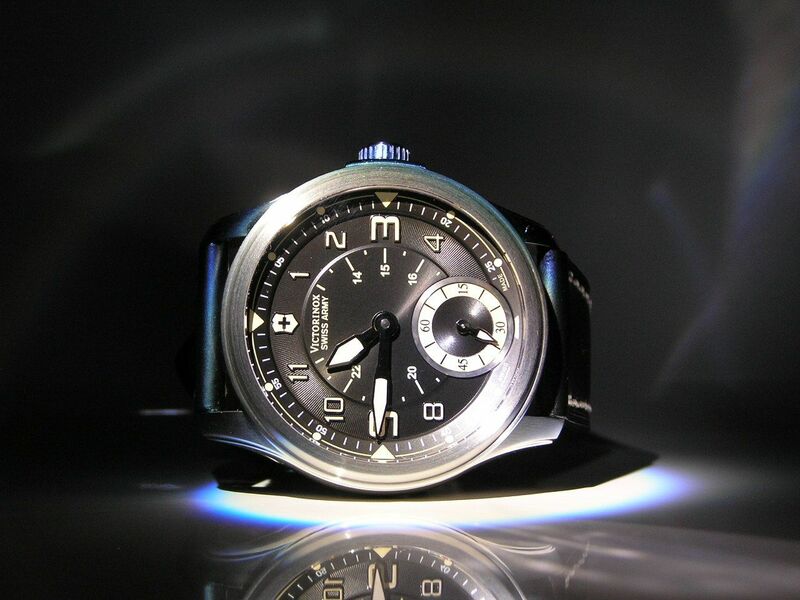 The larger arabics on the dial are luminous as well as the hour, minute and seconds hand. 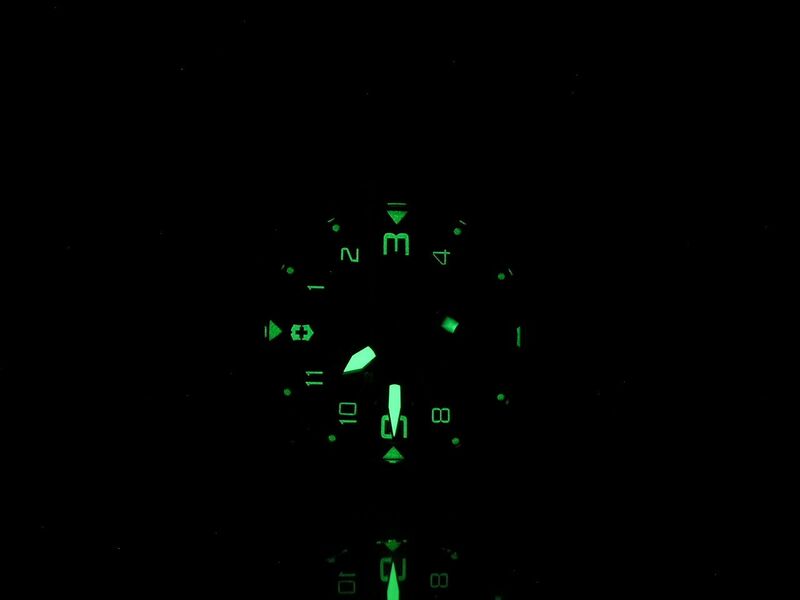 Lume quality is good. 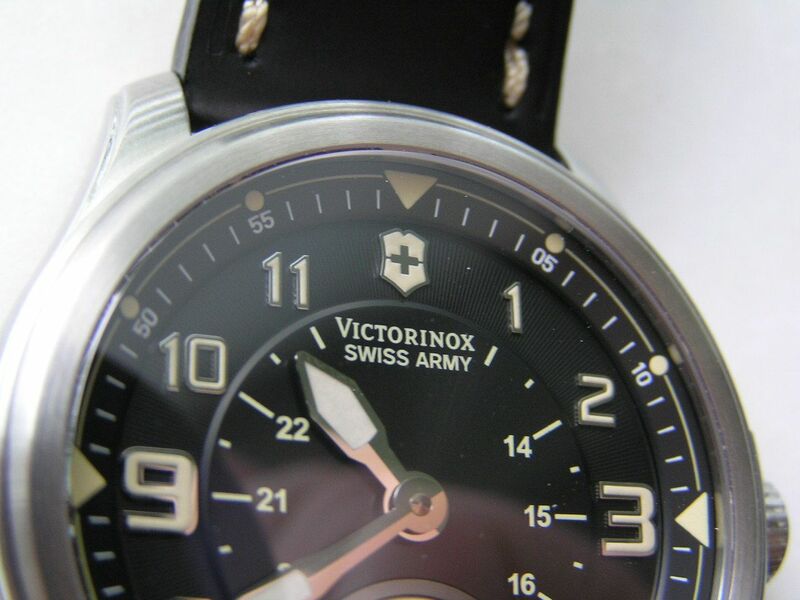 The hour and minute hands are sword style, silver with inset lume. The lume used on this watch is also the cream or ‘aged’ kind of Superluminova, which is in keeping with the vintage aspirations of this model. It looks fantastic. The subdial at 6 is perfectly sized to the overall proportions of this watch. 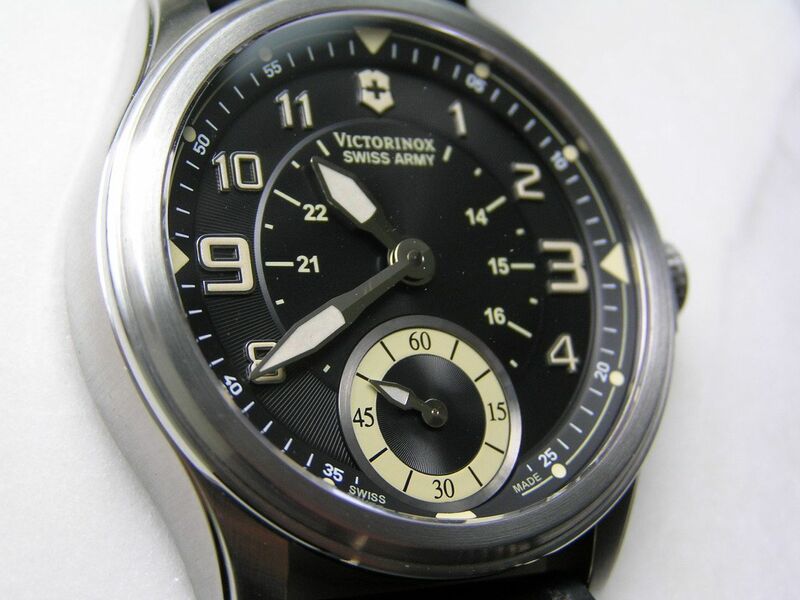 It has a slightly heavy silver ring around it and has an inner circular dial in black with a cream colored seconds track on the outside with arabics at each quarter minute and simple marks every five seconds. The seconds hand is the same design as the main hands and features inset lume as well. 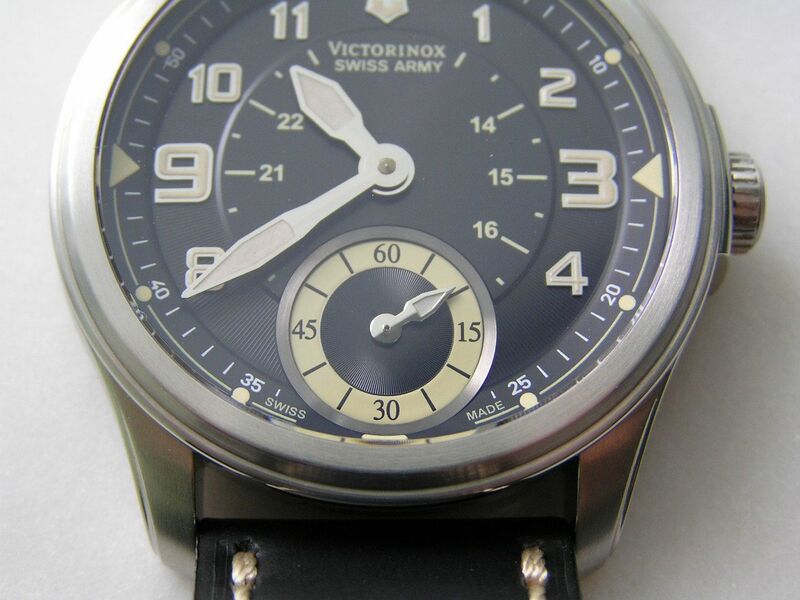 The dial is topped with a flat anti-reflective sapphire crystal. 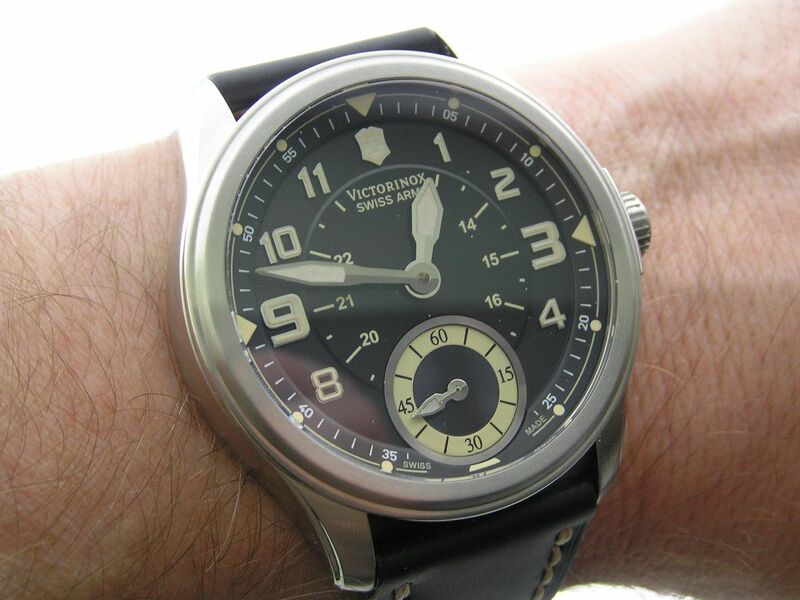 The entire dial is well executed and makes this watch very easy to read. 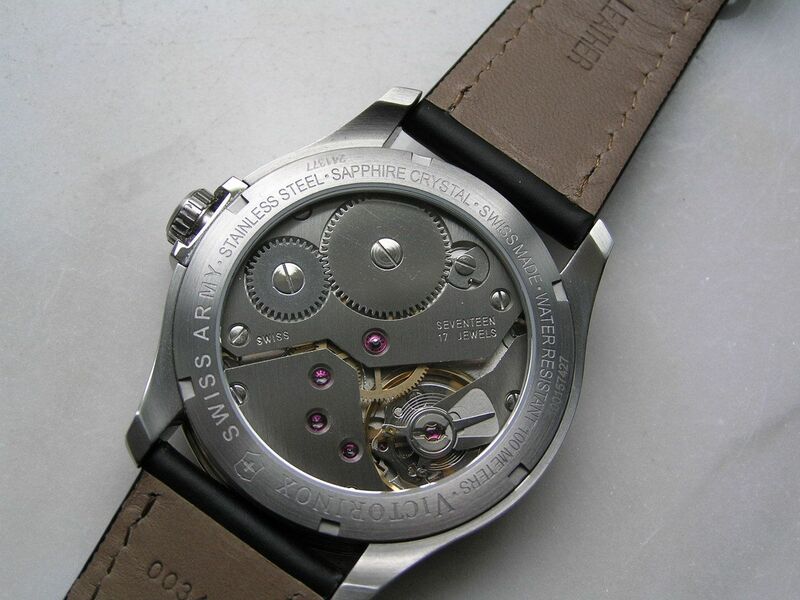 Inside the VSA Infantry Vintage Mechanical is the long-running and well-regarded Swiss Unitas 6498 ‘six eater’ 17-jewel manual wind movement. There are several grades of this movement available and this VSA sports the version with brushed plates, for a nicer look through the display back. The watch does not hack, but I have measured timekeeping accuracy at about +7/24 hours with a good 48.5 hour power reserve. The watch winds and sets smoothly. Absolutely no complaints from this tried and true workhorse of a movement. The VSA Infantry Vintage Mechanical is equipped with a smooth black leather strap with a slightly coarse off-white contrast stitch. 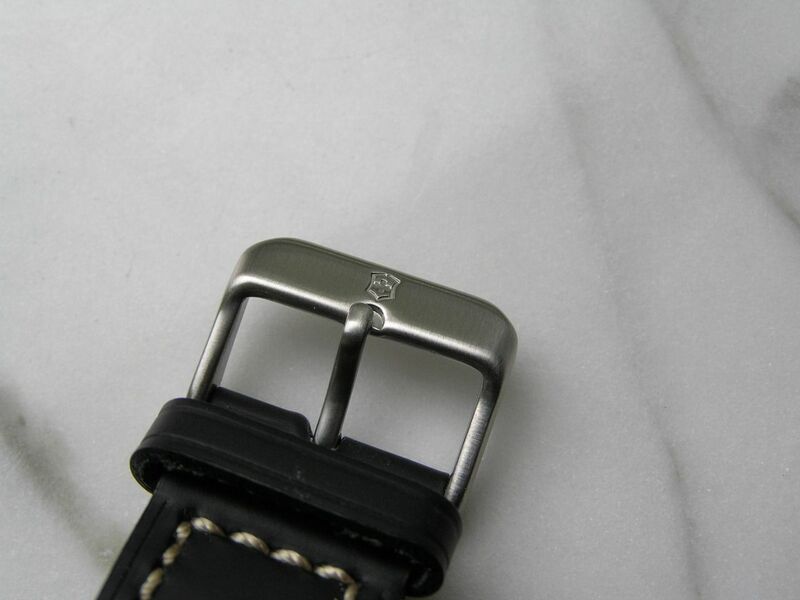 The strap is moderately thick without any padding. 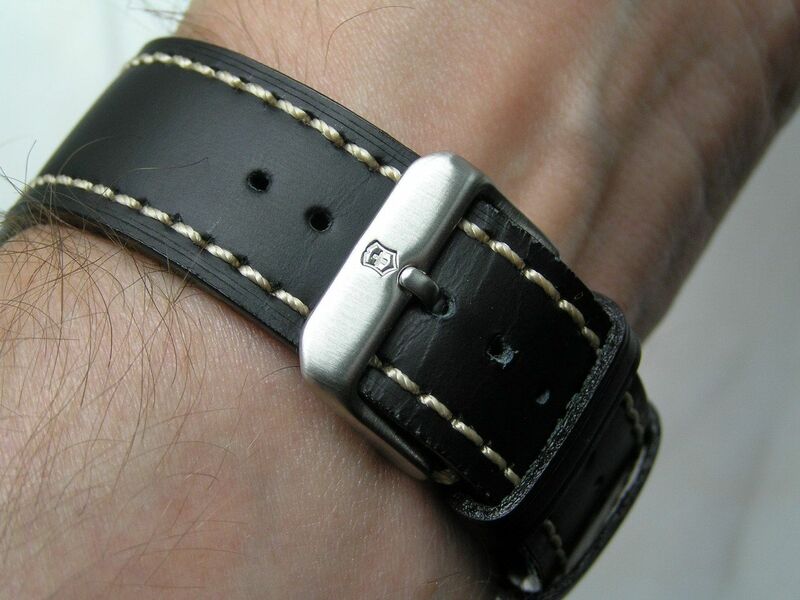 The strap measures 23mm at the lugs and tapers to 20.2mm at the buckle. The signed buckle is brushed stainless steel. 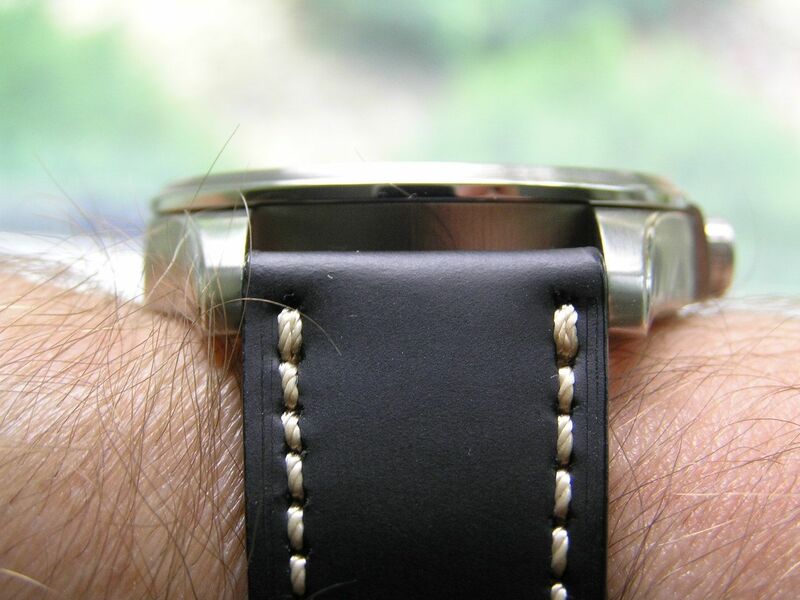 The look of the strap fits the overall tone of this watch; nothing fancy, but totally purposeful and attractive. 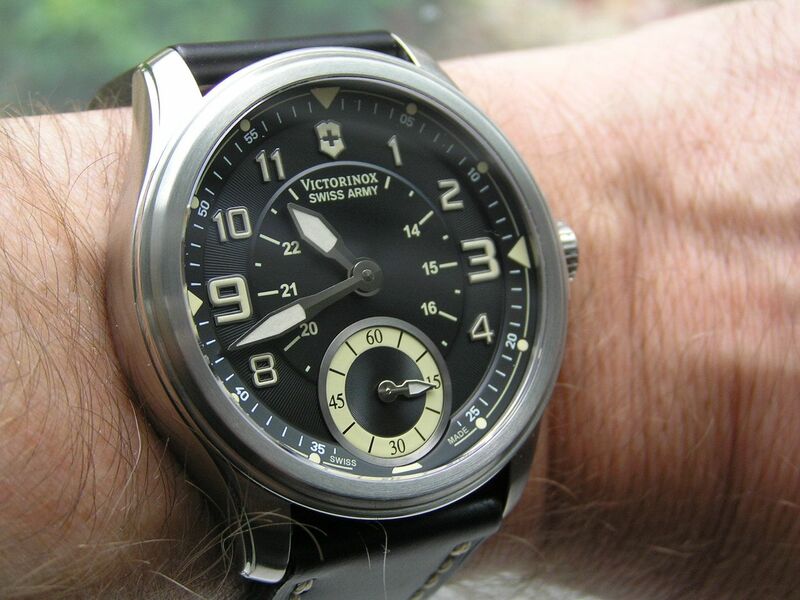 As I stated at the start of this review, although this VSA model is discontinued, you can still find them brand new if you look hard enough and many places are discounting them, so they represent a very good value for a Unitas 6498-based watch that has high quality and an acceptable size. 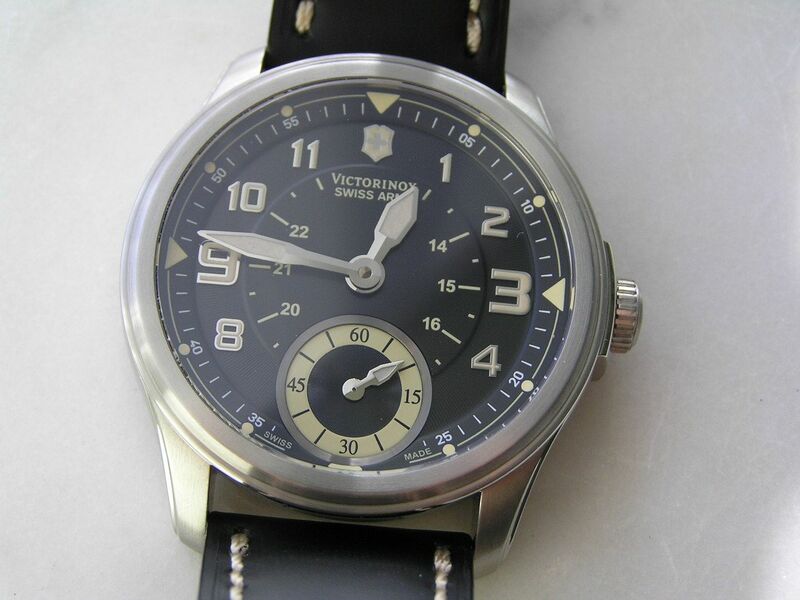 The VSA Infantry Vintage Mechanical is a superb watch that shines through its simplicity. If you enjoy the basic joy of a manual wind watch without any complications, you can’t do much better than this one. Highly recommended. Cons: still a large watch, too simple for some? 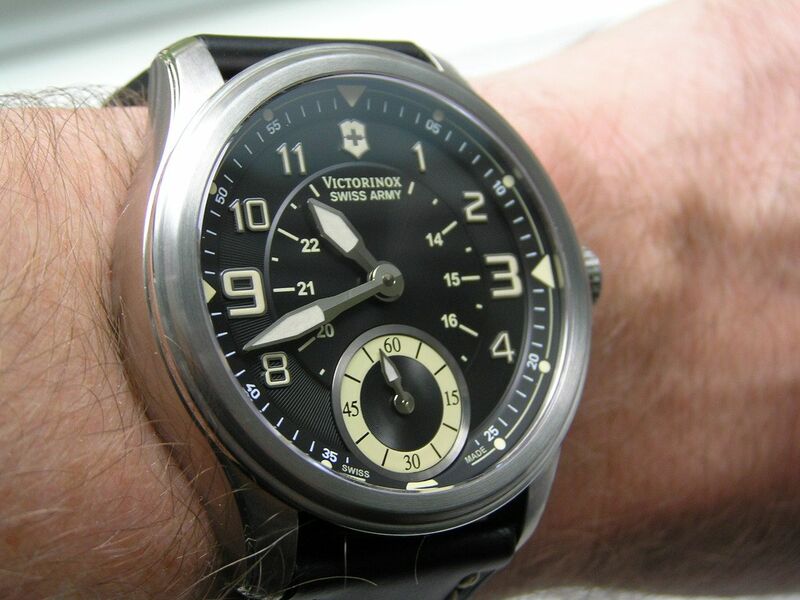 Verdict: VSA hits all the right notes with this one, the Infantry Vintage Mechanical is a great watch and can be easily appreciated for its classic/vintage style, quality and simplicity. Marc, Thanks so much for the really super awesome review!! If I hadn't already owned this watch, it would have sold me for sure. I got mine 01/2017 and honestly I have a hard time keeping from wearing too often, while ignoring other watches I also like in my collection. There have been evenings where I go home, take off my watch for the day, and strap this guy on. I LOVE IT!!! Greatest pix I have ever seen for this watch! Thank You ! I just bought mine moments ago ! Love it!